Australia… An exotic place for someone to wonder how to make this addicting and versatile Mexican chile pickle. What’s more, as much as Chipotles in Adobo are a basic staple in Mexican cooking, most Mexicans buy them ready-made in cans in stores and of extraordinary quality. Think mustard, do you buy it or make your own? Then again, time has proved there are more people into making things from scratch than what I thought: The most visited Post on my site, by far, is the one to make Pickled Jalapeños. Another chile pickle devoured by Mexicans from morning ’til night, from north to south, also usually bought ready-made in cans. Well, Cath, it has taken me a while. I am sorry. It has not been because I didn’t have your request in mind. On the contrary, I’ve been testing and tweaking my recipe here and there, for over a year (!) so that when you make it, it can be better than what you get in the stores. There are different types of Chipotle Chiles. All Chipotles are Jalapeños that have been ripened, dried and smoked. They all turn out to be spicy, rich and smoky. But different varieties of Jalapeños turn into different varieties of Chipotles. The smaller kind of Jalapeños, more intensely flavored and fragrant than the rest, turn into Chipotles Moritas, pictured above. Dark in color and deep in taste, they’re the ones I prefer. Commercial makers do too, probably because of their flavor and attractive color, but also because being smaller, they work well for the smaller sized cans sold in shops. You can also use Chipotles Mecos, pictured below. They are bigger than Moritas and with a much lighter color. They are tasty too. 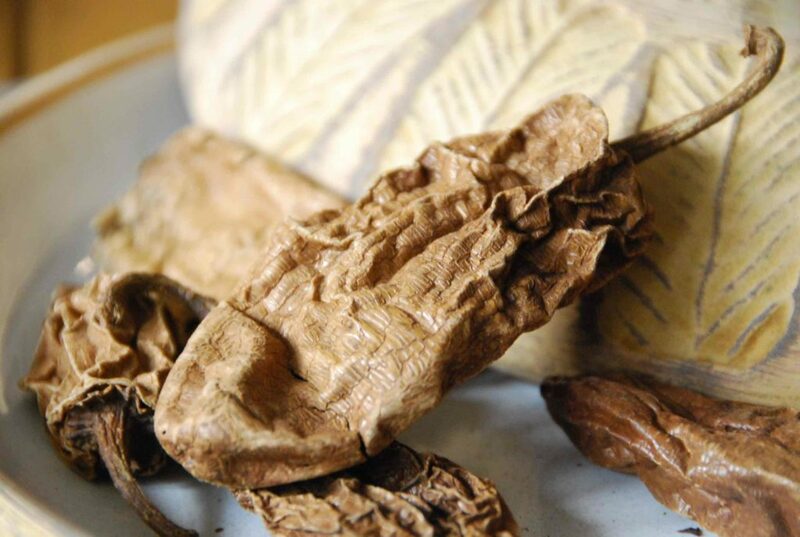 The perception exists, that it is complicated to make Chipotles in Adobo. It’s not. 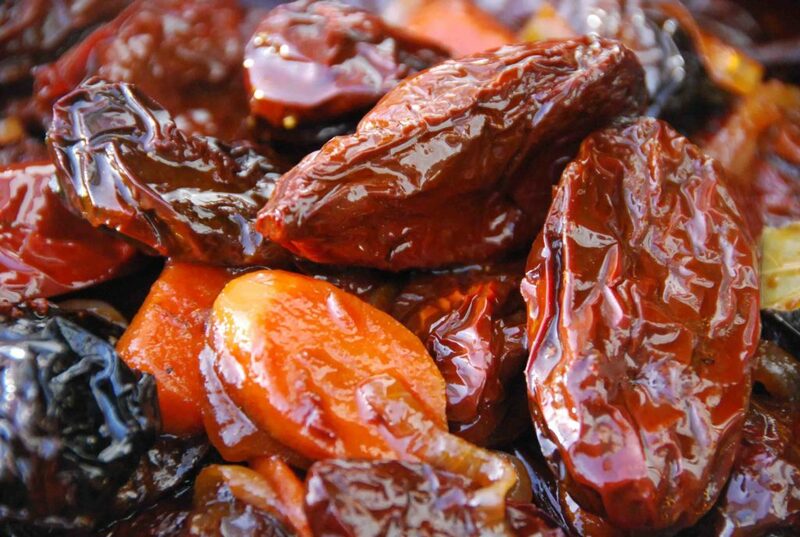 Chipotles need to be rinsed and simmered in water for about 15 minutes. This rehydrates and plumps them up, so they can absorb the flavors from the Adobo sauce and have a soft bite. Most recipes for pickling Chipotles, don’t include the Adobo element. But it is the Adobo which makes the store bought product so rich and delicious. 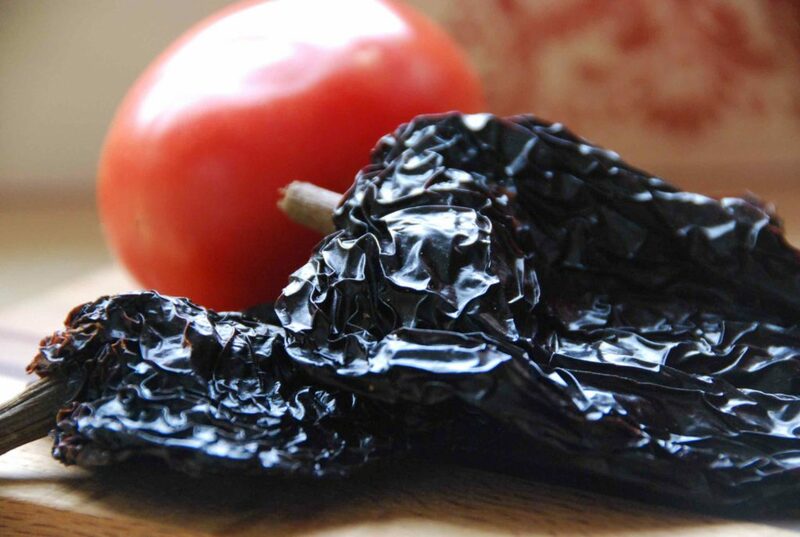 To make it, aside from the usual pickling suspects such as vinegar, oil and spices, after a lot of testing, I found out you need Ancho chiles. Some people add tomatoes some people don’t. My palate does call for them. Once the tomatoes and Ancho chiles are cooked in water until soft, and pureed, they make a rich Adobo base. Yes… The idea of marinating a Chile in the puree of another Chile is wild. But it is exquisite. 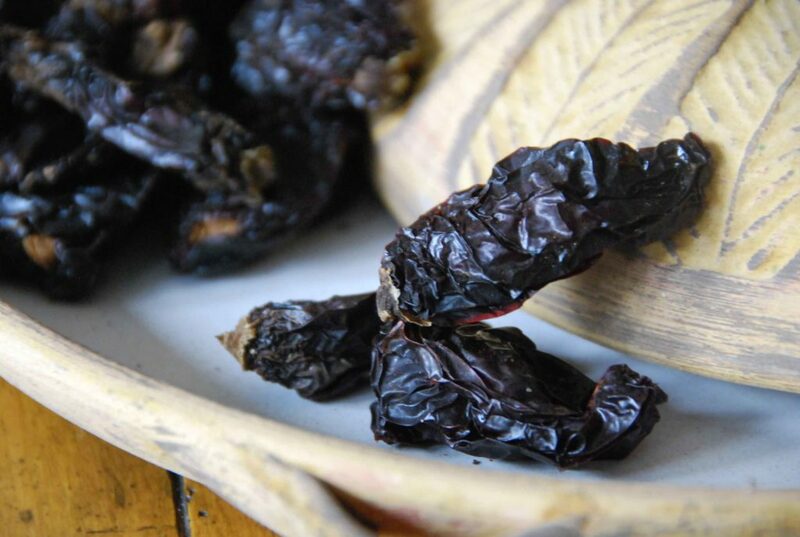 Chipotles are spicy, smoky and rich. Anchos are bittersweet, mild and have a prune like flavor. Trust me, they like each other’s company. 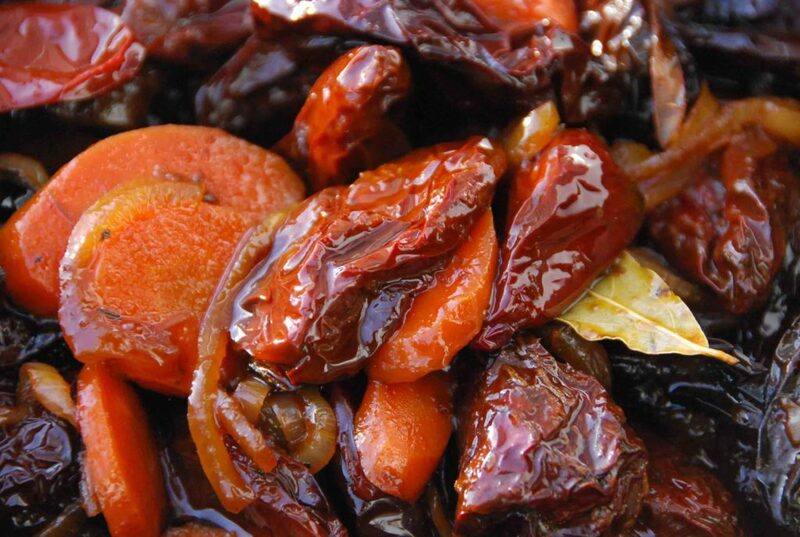 The Ancho chile base is cooked and seasoned over sauteed carrots, onion and garlic in olive oil. With the addition of marjoram, thyme and bay leaves. Then those chiles beg for salt and a generous amount of brown sugar, or piloncillo. What it does to those Chipotles is blissful. To finish the Adobo, pour rice vinegar and white distilled vinegar. 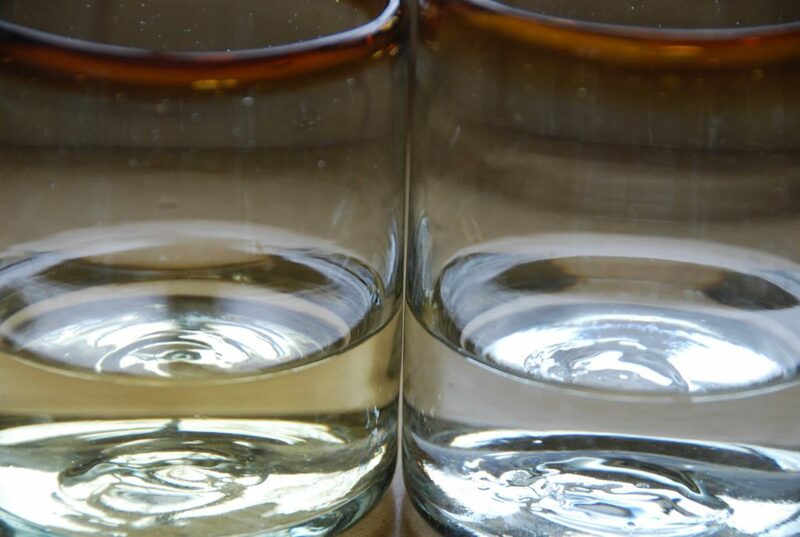 That combination of vinegars works as if you were using the fruit based home made vinegars traditional in Mexico’s countryside. Then you just add the chipotles, cook it all together for 10 minutes. And you are done. Once they cool off, place them in pint sized jars. This recipe will make four pints you can keep in the refrigerator until you finish eating them (they will last months and months and keep getting better). There may be a more important reason why most Mexicans don’t make their own Chipotles in Adobo Sauce. Not only is it because the product sold at the shops is so good. Or because there is the perception that it takes a long time to make them. I think its mostly because they are so good, and eaten in such large quantities, that any home cook would need to make Chipotles in Adobo continuously in their kitchen to meet the steady demand for more. Here you go Cath Kelly, I hope this recipe pleases you so. Now you got me in trouble, my husband says he will not eat the canned product anymore. Rinse the chipotle chiles and drain. Place in a medium saucepan and cover with water. Set over medium-high heat. Once the water begins to simmer, cook for 15 minutes. Turn off the heat. 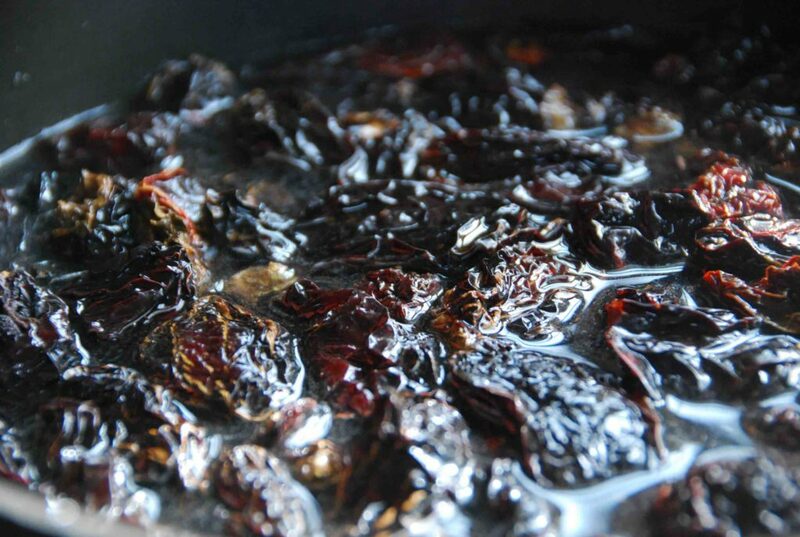 Place the stemmed and seeded ancho chiles and tomatoes in a pot and cover with water. Simmer for about 6 to 8 minutes until the tomatoes are cooked through and soft. Transfer to a blender with 1 cup of the cooking liquid, and puree until smooth. In a large saute pan, heat the oil over medium-high heat until hot but not smoking, about 1 to 2 minutes. 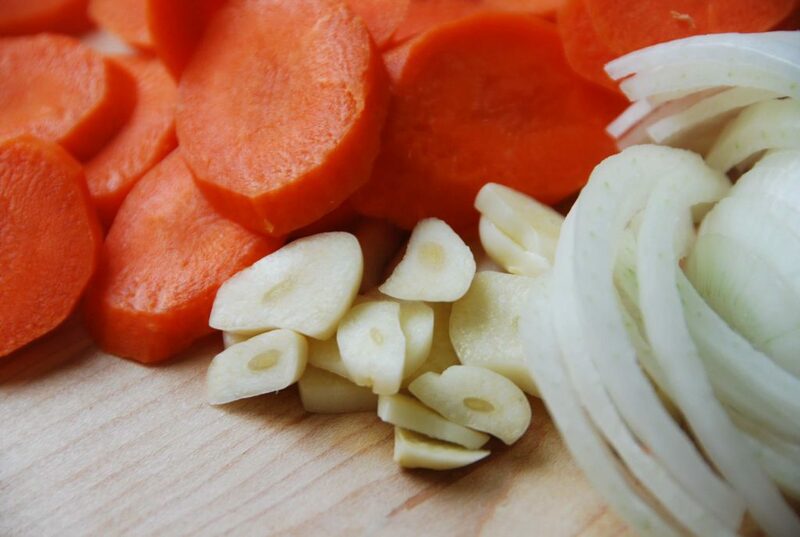 Stir in the carrots and onion, let them season for a couple minutes. Make some room and add the garlic, cook for another minute. Pour in the ancho chile and tomatoe puree, the marjoram, thyme, bay leaves, salt and sugar. Stir, and let the sauce season and thicken for 5 to 6 minutes. Pour in the vinegars, and cook for another 5 minutes. Finally, drain the chipotles, discard their cooking liquid and add to the mix. Let it all cook together for 5 more minutes and turn off the heat. Let them cool off and place in jars. Cover tightly and refrigerate. Give them a day before you eat them, so they will have had time to pickle and thrive in that adobo sauce. They will keep in the refrigerator for 6 months, if you don't eat them all first. I was so happy to find this recipe! You’re right — I can see how I will be making chipotles in adobo sauce at least once a week, because I use them all the time, so I may end up going back to using store-bought, but I have wanted to try making my own for a long time, and your recipes are fail-proof, so thank you, thank you, thank you!! Do you ever mix the mecos and moritas together in the same batch or do you use a single chipotle variety? You can mix them, but I prefer to use just one type. If you can, I recommend the moritas. I come back to this recipe every time I need to make homemade chipotle. Thank you, Pati, for sharing this gift with me, my family and friends. Katrina thank you so much for your lovely post! I’m so happy you, your family, and friends love it. Hi Pati, love your show. I love Mexican food, but am very new to cooking it. My husband is on a no salt vegetarian diet for a health problem. I am planning on making your chipotle chiles in adobo sauce without any salt. I know it will taste different …. but I have had to avoid all recipes that call for adobo sauce becaus of the salt restriction. I am so excited about this. Do you have any suggestions about me not using salt in this recipe? I am making two batches of homemade sausage – one a breakfast sausage and the other a chorizo(which is where I found the link to this recipe- I made a double batch of chipotle in adobo last night and it is AMAZING! I am standing at the stovetop eating it in small spoonfuls with my coffee this morning. I live in Portland Oregon USA and we are so isolated from good fresh Mexican cooking. The restaurant choices are expanding and improving but in terms of stocking the pantry for home cooks the selection is sparse. Sounds fabulous for a brisket, Sara! I’m a bit confused. Are these in a “thick” sauce like the canned? The pictures don’t display this and I see alot of liquid in the ingredients which leads me to believe they end up more in a “pickling liquid” rather than an “Adobo sauce”. Made this and was great! More complex and rounder flavor than the canned stuff. Even did a post about it on my blog because I liked them so much. http://stefangourmet.com/2015/04/11/homemade-chipotles-in-adobo-sauce/ Thanks for sharing! Just wondering, is it really a full cup of olive oil in the recipe? I haven’t started it yet, but really looking forward to it. Hi Paul, So happy you want to try this recipe! Yes, it’s 1 cup olive oil. Hello Pati, thanks so much for this and all your recipes. And of course your Mexican Table show. It is informative and entertaining, I have learned so much from you. I found this recipe more than a year ago, and am finally getting around to making it. — I like my Chipotles in Adobo Sauce to by quite hot/spicy. Most of the store bought cans are just not hot at all (to me). Is this recipe going to give me a nice, hot result? If not, what should I add to make it more spicy? If I toss in a raw habañero or two, would that kill the flavour? — Also, you say these will keep in the refrigerator for six months. What if I don’t have room for four pint jars in my fridge? Is there a way to “process” the jars so they are shelf stable? Thank you in advance for taking time to help me! These are pretty spicy! You can of course add a habanero. If you don’t have room in your fridge, just process your cans per your canning equipment instructions, or as you would jam or salsa. Thanks for the fast response, Pati! Happy holidays to you and your family as well!! I made a trip to my local Mexican grocery (Dos Hermanos Mkt in Ypsilanti, MI), but they had only one small package of the Moritas, and no other Chipotles at all! I was seriously bummed. I purchased what I could, including the Anchos, but will have to make another trip in a week or two. Assuming I do a decent job with this, I think I’d like to make more to give away to friends and family. Being able to process the jars so they are shelf stable is a good thing. Thank you for confirming I can do this. And thank you again for the kind reply. Have a great and happy new year! Pati, we never seem to have enough adobo sauce, it seems to end up on everything. Will the intensity of the flavors be lessened if you double the adobo ingredients? Or, would we be better off pureeing (sp? )a portion of the original recipe to increase the volume of sauce? So far, I’m using the recipe with one small change.. I add Pasilla Chili with the Ancho at the beginning. Love the flavors. Was wondering about larger quantities and if it is as easy as scaling the recipe x 4 as an example. I want to bottle as gifts as gifts over the Festive period. What would you suggest? Hola James, Will make great gifts! Yes, just multiply the recipe. I’ve been wanting to try this for months! Finally got every thing together and can’t imagine we’ll be buying chipotles in adobo from the grocery store anymore. Are the carrots and onions just for enjoying or do they serve a role in the outcome? Hi Gary, The carrots and onions add flavor. I’m so happy you are trying my recipe; let me know how it goes! They turned out as tasty as one could possibly imagine. I see batch 2,3,4,etc. coming shortly. found this recipe today – am looking forward to making it this weekend. Since a have an enormous harvest of jalapenos and poblano chiles from my garden this year, I am going to attempt to dehydrate my own peppers first. 2 questions: I live in Ohio, so we really don’t have super hot summers, so my ripe chiles are green not red. Do you think this will affect the taste of the chipotles in adobo recipe? Secondly, I would like to can these for shelf-stable. Looks like there’s plenty of acid in this recipe to be safe – any thoughts on that? Great, Anne!. YES to both questions. Report back! Anne, I live in SC and can grow ripe (red) Jalapenos with no problem. The 1st problem is getting enough ripe peppers at one time. The 2nd problem, if you’d call it that, is smoking/drying that many. It took me 3 days to complete the process and only had a few ounces. After purchasing the amount that 1 batch requires, I determined that it would be virtually impossible to achieve this quantity or quality with a home smoker and dehydrator. The cost of 1/2 pound from the latina grocer was less than $3 and they’re very good quality. I’ve looked 4 a recipe 4 chipotles 4 a long time; thank u 4 d instructions & recipe. Luv ur show & enthusiasm w/which u interact w/ur audience. Pati, do u have a good recipe 4 panuchos, if so share it, thanks! B richly blessed in all ur endeavors! Gisela, Thank you so much for your message! I am happy you found my chipotles in adobo recipe. Will try to post panuchos soon. Thanks for your message!! I hope you try making the chipotles in adobo. I can everything! Including chipotle en adobo – this recipe! 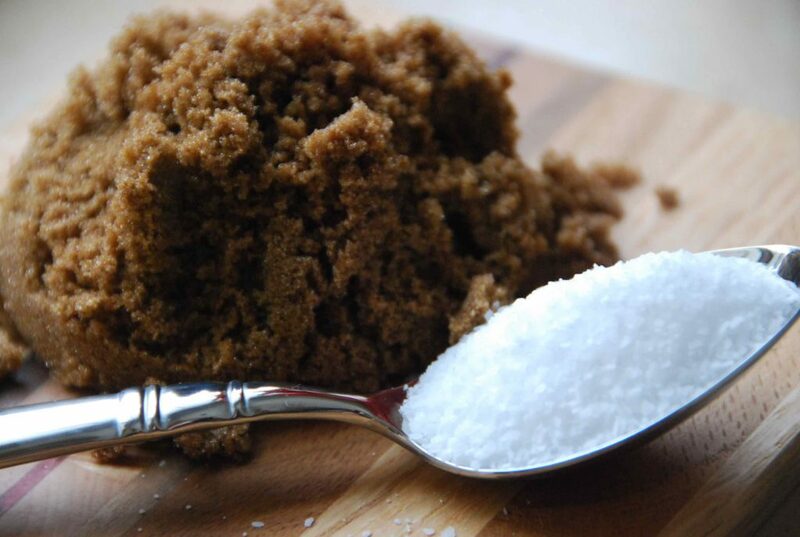 However I reduce the amount of sugar-our taste-and also because we are diabetics. I wouldn’t make all these recipes(I wouldn’t like them), but the recipes of Pati’s I do use are GREAT! Most of what I can or cook or bake I give as gifts, or keep my pantry stocked for those occasions that I need or want them. I caught the tail end of a cooking show (not yours) that I swore included the ingredient “Avocado leaf” in their adobo sauce (something I too have wanted to try making for some time). Is this a traditional Mexican ingredient and if so do you think it would go well in adobo sauce? I’ve also had trouble finding it so I am now wondering if I heard correctly….. Yes! It is a traditional ingredient, it is fragrant and delicious. 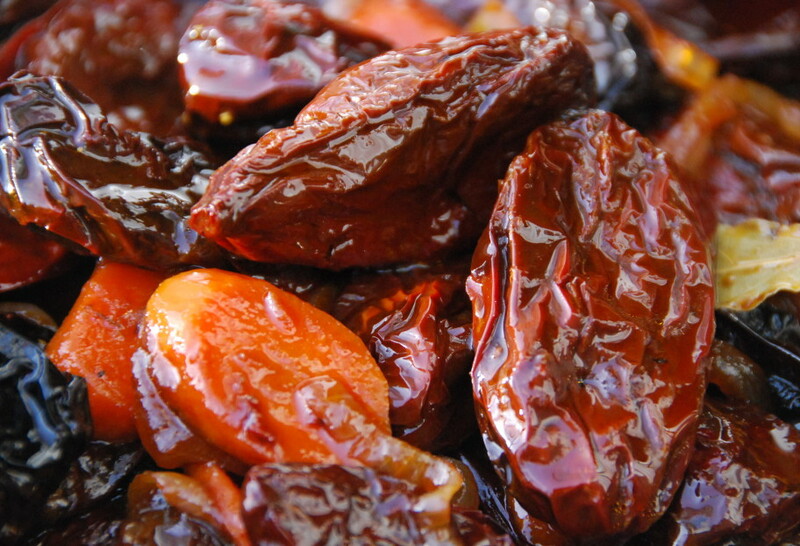 It is more likely that you will find it dried… Yes it would go well in an adobo sauce, use sparingly. The avocado leaf has me intrigued. Is it just a leaf from a regular avocado tree? I’ve got a tree in the yard and was wondering if I can just pick one off of it? This recipe for chipotles in adobo looks amazing. I can’t wait to try it!!! I just made a batch last night from another recipe but it’s a little uninteresting hence my search for something better. I think I have found it! Thank you!!! This is probably the best blog I’ve ever searched!! It is very informative and easy to use. Its bright colorful and even though I’m gluten intolerant there are a lot of recipes I can use. Thanks so much Pati, for all your amazing recipes and the knowledge you have of your ingredients. This site is like reading a book I can’t put down! So glad to hear this Shelley! I cannot wait to make this, but can you explain the cooking liquid? It states “see below” I think I am missing something, can you explain? I just found your website and I am hooked! Cannot wait to start cooking! Hey do you think I could can these the same way I do tomato sauce? Have you (or anybody else) tried? Yes you can, give it a shot! Thank you for the recipe, I will collecting the ingredients this week. My son, who can’t tolerate gluten, also can’t tolerate soy, and so often, canned adobe has soy. Looking forward to the recipe. Thank you again for great instructions, photos as well. Thank you, Kathy! I’m so happy you found the recipe so you can make sure your son’s chiles in adobo are gluten free. I hope you both enjoy them!! Pati, these are without a doubt, the best I’ve ever had. I underestimated the heat that they would retain, and ended up with numb lips for a while, but when I figured out the balance, they were perfect. I used them in a dish of mashed chipotle sweet potatoes with bacon and hickory syrup, and everyone loved it. Thanks again for a great recipe. I smoked jalapenos all day, and I just finished simmering them in your adobo recipe, and my house smells insanely smokey delicious. I can’t wait to use these peppers…. Hola Justin, I love the way my house smells when I cook peppers too! Let me know how you use them. Wow! This recipe is amazing! I’m from Australia and buying chipotle hot sauces is really difficult. I bought some dried chipotle peppers used them in the adobo. I ended up puttingv the finished product in the vitamix and diluting it a little with water and vinegar and now have bottles upon bottles of chipotle hot sauce yay! So glad you enjoyed the Chipotle in Adobo Sauce recipe Jamie! Gracias muchisimas gracias Paty por compartir tus recetas yo soy admiradora tuya y quisiera aprovechar hojala no este abusando no tienes alguna idea de como hacer el chorizo person por mi atrevimiento y gracias. We have been smoking our jalapeno’s for years then freezing them to add to soups, chili, etc. This adobo is just what these chipotle’s need! I wonder if I can preserve them? Awesome! Finally, an article that completely explains chipotle chilis! Just wondering if you de-seed the chipotle peppers will it just be a milder taste? Thanks. Thank you for your question Amanda! Yes, if you de-seed the chipotle peppers, the sauce will have a milder taste. If you are going to de-seed them while making the sauce, then do it after they have boiled and rehydrated. However, by de-seeding them you are breaking apart the pepper and this will affect the texture and taste of the sauce. I would recommend de-seeding them right before you eat or use them! We love your receipes so much and love natural cooking. We have a thought and need some ideas. A plum tree going to waste and all those lovely plums…. what can we make and some ways to preserve them for later…Love your show…. We enjoy yours over everyone else’s. You really make real food people want to eat. Thanks…. hi, great show, On Monday April 25, 2011 the music playing through out the show was great. Could you tell me the name of the group or groups. Hola! Me da MUCHO gusto haver encontrado esta pagina! Como he buscado una buena receta de tacos alpastor. No tendras una por ayi??? Hay tantas en el internet que ya ni se pa donde jalar! Muchas gracias por todo el esfuerso y amor que le pones a tus recetas y a tu pagina. I came to this late, but I’m so making these. Congrats on the new show! I’ve been a fan since your first Wash Post articles. Great recipe, great photos, great writing! I will have to try this, as chipotles en adobo are on the top of my favorite chile list. Esta receta la probaremos en casa de inmediato. solamente de leerla, ya siento en el paladar los sabores. Las fotografÃ­as estÃ¡n extraordianrias. Bravo! 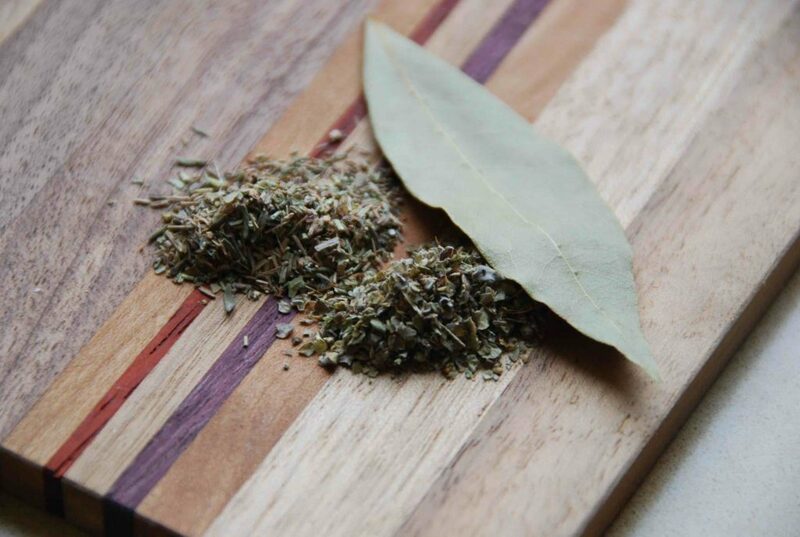 Thanks for demystifying one of my favorite flavors, Pati–the photos are gorgeous and the recipe makes my mouth water! All good things come to those who wait! I made your Tatcha the other day – sooooo goood – especially with a big dollop of sour cream. Oooooooh. That’s how I like my Tacha too. Oh WoW! You know where I’ll be later onthis week – in the kitchen cooking up chipotles in adobo! I can’t thank you enough! Hi Pati!! I can’t believe I got so lucky to find your website, as I’ve been searching for a genuine chipotle recipe for 12 months too!! this past summer (Australia summer 2014), I decided to grow my own jalapenos and smoke them and try to make chipotle sauce. I’ve now smoke the jalapenos but have not been happy with the recipes I’ve found on Internet, until I found yours. I will make the sauce today. I already have the ancho chillies which I purchased in San Antonio Tx when I was last there in June 2013. YAY! Glad to be of help.